• Multiband feedforward Pulse Width Modulation (PWM) processing gives a powerful, well-defined sound and brings a broad range of user control to the audio signature. • Digital synthesis of the multiplex baseband signal yields optimum stereo separation and ensures adjustment-free, rock-stable operation. • Dual MPX and WEBCAST Output, designed for multicast at the same time audio broadcasting. throughout the product to facilitate maintenance anywhere. DIGITAL SYNTHESIS SAMPLING RATE : 608kHz (16X subcarrier oversampling) and Centre Sampling at 1216kHz (32X subcarrier oversampling) to eliminates integration of switching noise that is concurrent with leading and trailing edge of waveform steps. MPX (Composite) CLIPPER : Baseband clipping may be adjusted between 0dB and 2dB. Clipping is performed prior to pilot injection. 1V p-p and 10V p-p with reference to 100% carrier modulation. WEBCAST OUTPUT : Nominal 100-ohm, Stereo unbalanced XLR output is fixed approximately @ +4dBu output, Low Pass Filtered, De-Emphasized. NOISE : Better than 70dB below 100% modulation in decoded L/R audio. Individual digital noise components above 54kHz are –70dB or better. DISTORTION : <0.5%THD in baseband and subcarrier at 95% modulation with PIPP* limiter defeated; <1.5% at any level of modulation with PIPP* limiter engaged. 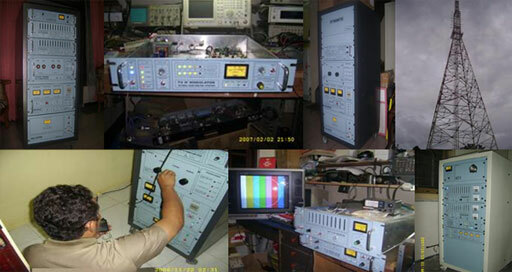 CROSSTALK (M/S or S/M) : Nonlinear crosstalk is better than –50dB, 50Hz-15kHz. Linear crosstalk (through processing and filters) is better than –40dB. program line levels between –15dBu and +10dBu. GATED A.G.C. : ±15dB capture range corrects for long-term input level variations. PROCESSING : Subtractive Band-Splitting of peak-weighted limiting employ a secondary ‘platform’ function to furnish average-level compression of program dynamics. Spectrum-subtraction band division has second-order crossovers at 100Hz and 4,2kHz. Adaptive Pre-Emphasis : 75μs or 50μs selected by internal jumpers. Polarity Independent Peak Processing Limiter : Proprietary circuitry assures full carrier deviation by program audio regardless of signal asymmetry. POWER REQUIREMENTS : 210-255VAC, 50/60Hz; 15W. SIZE AND SHIPPING WEIGHT : 6Cm-H x 48,2Cm-W x 40Cm-D (1,5U); Approx. :5Kgs.